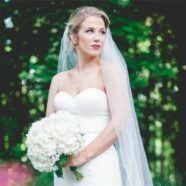 This wedding dress was worn by Kelsey May 26, 2017 when she married her sweetheart Andrew W. at Eden Try Estate in Fredericksburg, Virginia. 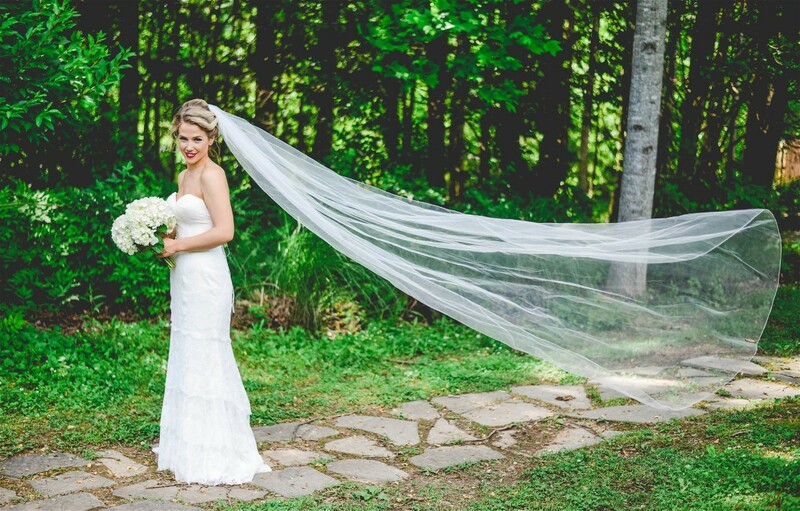 Kelsey found her beautiful, Chantilly lace gown at Serendipity Bridal and Events in La Plata, Maryland. 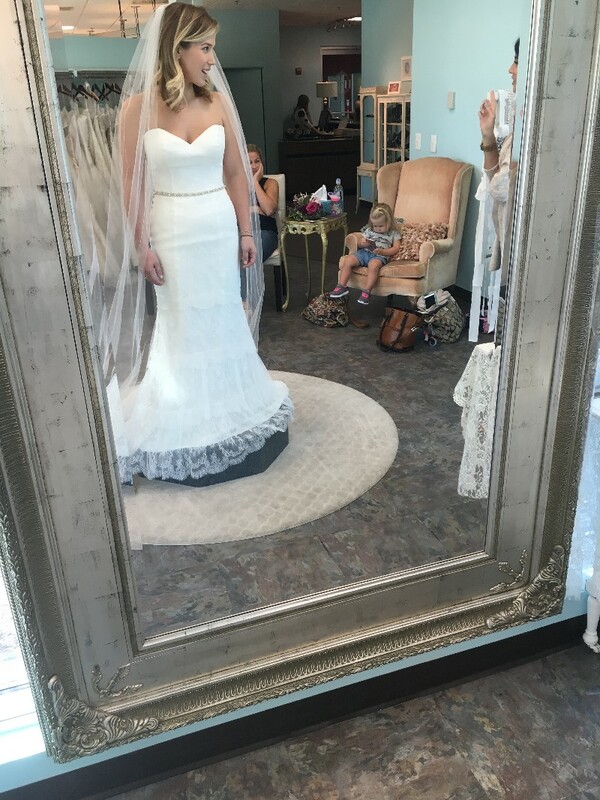 Its the same place her sister found her wedding dress. This was definitely a family affair, with her mother, father, sisters and even nieces in tow! Kelsey looks stunning in her gown. It is definitely a very flattering style for her beautiful figure. Kelsey’s mother, father, sisters and nieces all help her with her wedding dress decision. Kelsey checks out her gown choice in mirror. Notice the helpful nieces in the background. Wedding dress preservation will keep Kelsey’s gown looking as lovely as they day she wore it. Wedding dress cleaning made Kelsey’s hemline pristine even after outdoor photos. Kelsey’s outdoor photos are lovely. But all that time in nature during her wedding festivities did a number on her wedding dress hemline. 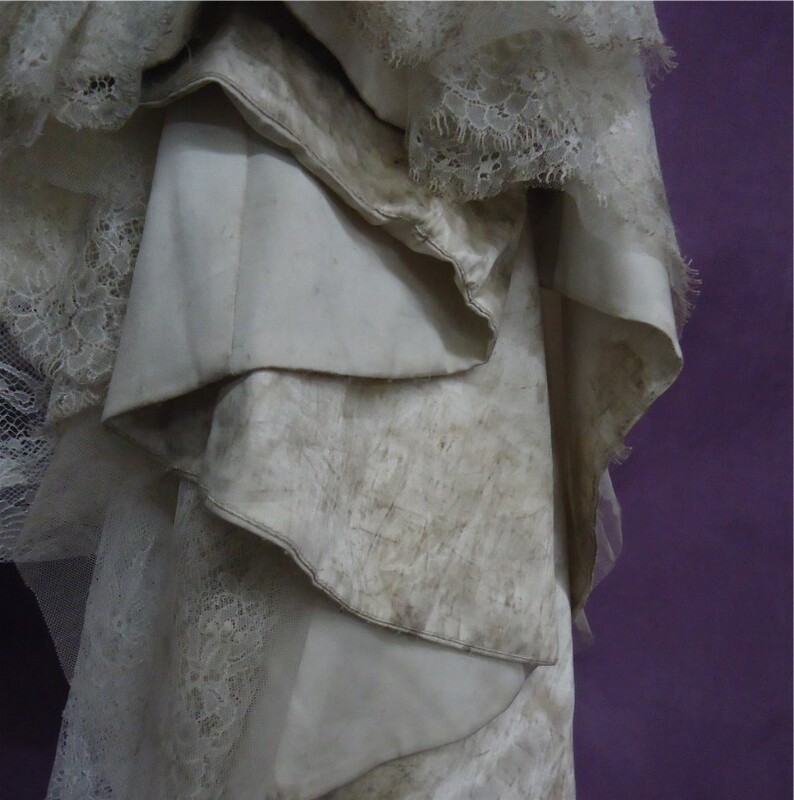 Her beautiful ivory satin Beloved wedding dress with Chantilly lace overlay had a severely dirty hemline when we received it for wedding dress cleaning and wedding gown preservation. 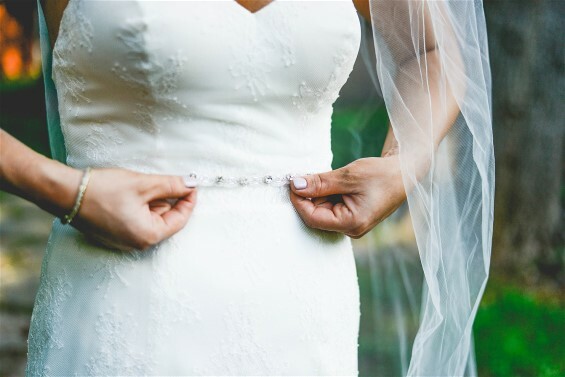 There were severe stains throughout the lace of entire dress, along with perspiration stains (every dress has them) and black marks on the inside of the bodice, makeup/spray tan on the outside of the bodice and top of bodice ridge. There were also some needed repairs including a large hole in some of the netting. Her ivory floor length veil with piped trim was also dirty in the piping and had two large rips in the train area and a small hole. Let’s face it, weddings are stressful and a bit messy! Our expert wedding dress cleaning included a chemical pre-treatment followed by extensive cleaning. We replaced the missing eyelet, repaired the seam of the inside lining, re-attached the connector string of the top layer, repaired the large tear and lace that was un-attached. 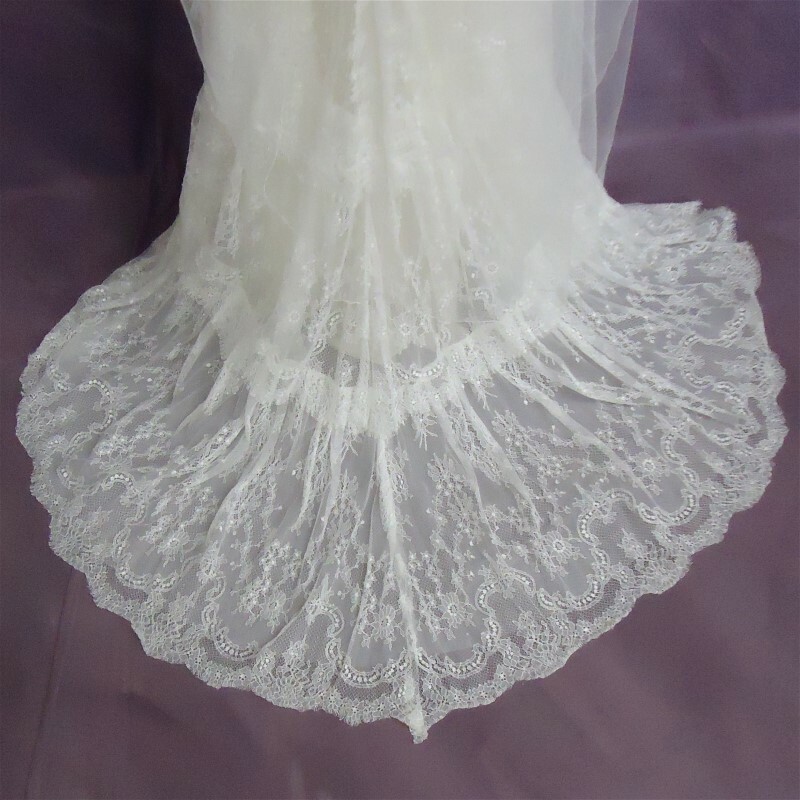 Repairs in tulle and lace are done with silk thread for minimal visibility. After getting her dress to a beautiful condition once again, we gave it Museum Method™ wedding dress preservation which will keep it looking lovely for years to come. Get your Free Quote for our expert wedding dress cleaning and museum quality wedding dress preservation services. Closeup of Kelsey’s hemline BEFORE wedding dress cleaning. Closeup of Kelsey’s hemline AFTER wedding dress cleaning. 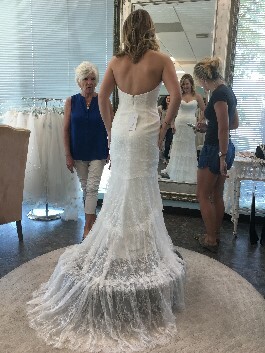 Kelsey’s wedding gown before wedding dress cleaning. Kelsey’s wedding gown AFTER wedding dress cleaning.